Size of this preview: 800 × 532 pixels. Other resolutions: 320 × 213 pixels | 974 × 648 pixels. 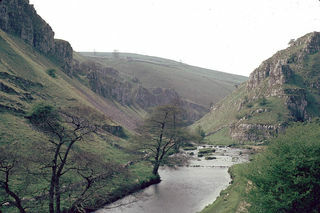 Drabber Tor, Wolfscote Dale at confluence with Biggin Dale, Derbyshire/N. Staffs. Looking NW. Castellated crags flanking the southern part of Wolfscote Dale composed of well-bedded pelletal calcarenitic limestone with thin micritic limestones of Lower D1 or S2 age (Woo Dale Limestones). This page was last modified on 6 June 2014, at 11:36.